New footage has recently emerged which offers further confirmation that the US coalition facilitated the exit of Islamic State terrorists from Raqqa when the city was liberated in October. Fighters of the US-backed Syrian Democratic Forces (SDF) confirmed from Raqqa that they had shot the footage showing militants of the self-proclaimed Islamic State (IS; formerly ISIL/ISIS) peacefully leaving Raqqa on their watch. “This is the footage we shot. We still keep them,” said the SDF fighter in late November, holding the mobile phone on which the footage was recorded. “We saw them with our own eyes. I was on shift at the Grain Containers turnabout when IS were leaving. There were many of them, we were not afraid of them,” he said. An investigative report by the BBC in early November alleged a “secret deal” that allowed hundreds of IS fighters to depart embattled Raqqa under the eyes of the SDF in early October, as the fight for the city was drawing to a close in early October. The new footage was obtained from the SDF and published online a week ago. In the above clip, SDF members also confirm that they filmed the ISIS convoys leaving on their personal cell phones. The BBC also confirmed the deal which even allowed foreign fighters to relocate to different parts of Syria and even neighboring countries like Turkey. “The deal to let IS fighters escape from Raqqa - de facto capital of their self-declared caliphate - had been arranged by local officials. It came after four months of fighting that left the city obliterated and almost devoid of people. It would spare lives and bring fighting to an end. The lives of the Arab, Kurdish and other fighters opposing IS would be spared,” the BBC continued. According to the report, some 250 Islamic State terrorists were allowed to leave the city, along with 3,500 of their family members that were trapped in Raqqa with them - though other reports put it at a far higher number. “We didn’t want anyone to leave,” says Col Ryan Dillon, spokesman for Operation Inherent Resolve, the Western coalition against IS, as quoted by the BBC. “But this goes to the heart of our strategy, ‘by, with and through’ local leaders on the ground. It comes down to Syrians – they are the ones fighting and dying, they get to make the decisions regarding operations,” he added. 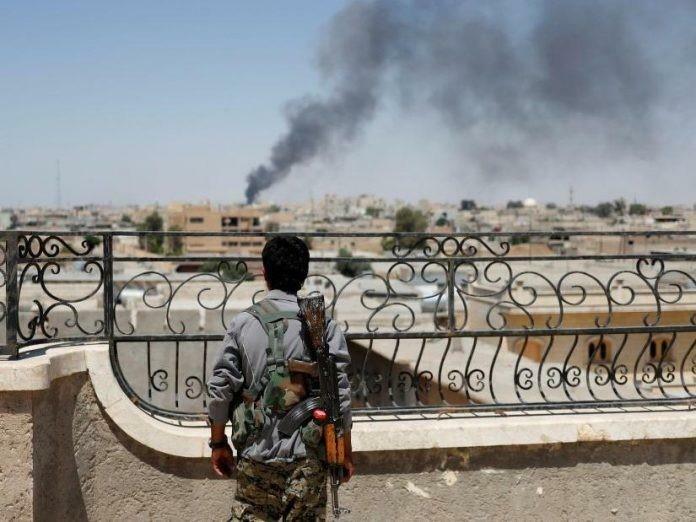 The Islamic State fighters reportedly fled to many areas, including Turkey and the Deir Ezzor Governorate. The U.S. Coalition had previously criticized the Syrian government and Hezbollah for allowing a smaller convoy of ISIS terrorists and civilians to leave the Lebanese border for the Deir Ezzor Governorate.